Having ancestry in northern Europe (Switzerland), I naturally gravitated toward Northern Renaissance art in college. 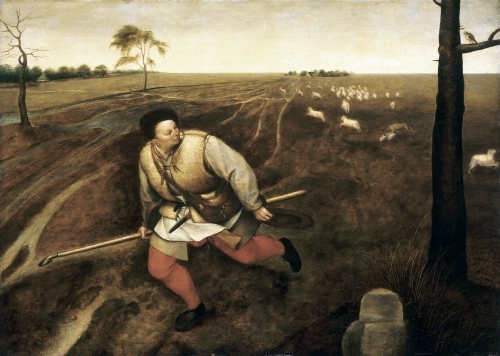 I’m particularly fond of Flemish artists, because they reflect a similar unvarnished view of reality to that of Swiss artists of the Renaissance. I've always loved the Brueghel family of painters because of their genre scenes, but discovered a work in the Brooklyn Museum by a family member that is a glorious still life. Jan Peeter, like his uncle Ambrosius (1617–1675) and his brother Abraham 1631–1690), was a master of still life painting. All three were descended from the famous Renaissance painter Pieter Bruegel the Elder (ca. 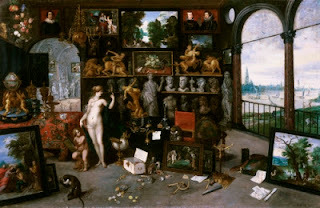 1525-1569) by way of his son Jan Brueghel the Elder (1568–1625) and his son Jan Brueghel the Younger (1601–1687), both of whom were primarily genre painters like Pieter the Elder. 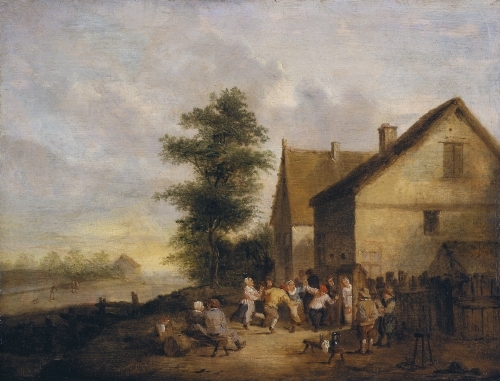 Jan Peeter, along with two brothers Abraham (1631–1690) and Jan Baptist (1647–1719), carried on a tradition of forging subject matter that was to become standard genre in Western art. While Pieter the Elder pioneered painting of everyday (often vulgar) life, Jan Peeter asserted the floral still life as accepted subject matter for art patrons. The Renaissance in Western Europe was a period when religious subject matter, which had dominated art since ca. 500 ce, began to decline as the major genre in painting and sculpture. Portraiture, landscape, and still life began to be accepted as “fine art” as the middle class improved in prosperity and began to patronize art, and as the Roman church’s power declined, especially after the Protestant Reformation (ca. 1523). Rather than preachy religious subjects or grandiose history subjects, middle class art patrons desired to see reflections of their everyday lives, especially in portraiture and still life. Ironically, although still life and genre seem like worldly subjects, many held moralistic symbolism. 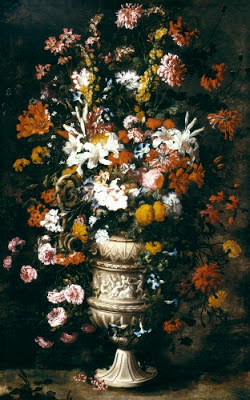 Such lush floral bouquets as this were often associated with the idea of vanitas (Latin for vanity). They were meant to reflect on the fact that no matter how beautiful the physical world is, like the flowers, death claims human beings. 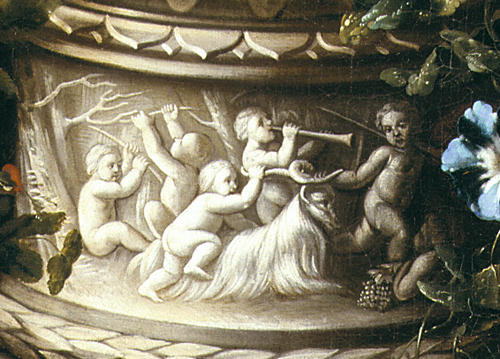 In this work, the putti (child angels) also allude to the eventual end of life. Putti, or cherubim, were introduced into Christian art to represent innocence in contrast to sin. When linked to a vanitas subject, they reflect how sin is the downfall of the human/physical self. Jan Peeter became a master in 1645 in Antwerp (Belgium) and stayed there until 1654. He moved to Rome after 1664 and died there before 1684. Like many northern artists, he wanted to immerse himself in classical and Italian art. This painting, which dates from his Roman period, reflects the classical influence in the vase, but the style is entirely in keeping with Dutch and Flemish Baroque still life of the period. 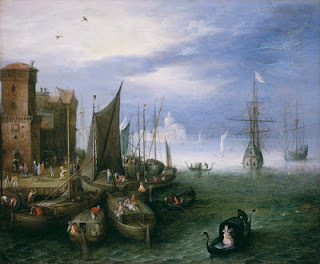 It is interesting to note that Jan Peeter’s aunt Anna Brueghel (died 1656) was a painter and pupil of Peter Paul Rubens (1577–1640), and she wed another of Rubens’ pupils, David Teniers the Younger (1610-1690), who went on to become a celebrated painter of genre subjects who was particularly known for depicting poor Flemish people. I think I prefer the floral still life! Studio activity: A floral still life. Cut out different shapes of flowers using various colors of construction paper and arrange them so that they reflect a mood or attitude. Make a pencil drawing study first on a piece of construction paper (of any color desired) and then apply the cut out shapes to the outline. Use stronger values for shadows and flowers that recede from the viewer, or use colors of construction paper of approximately the same value.